The period covered initially by Arts:Search is 1923-1925. Available soon. Generally considered one of the most important British periodicals devoted to typography. 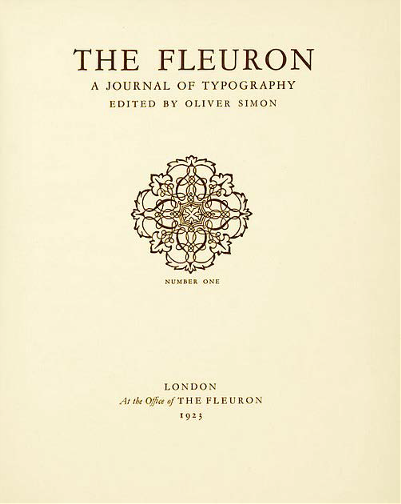 Edited by the influential typographic consultants Oliver Simon and Stanley Morison, The Fleuron was the journal of the Fleuron Society, founded by Simon, Morison, Holbrook Jackson and Bernard Newdigate in London 1922. The journal soon achieved an international reputation for the quality of its articles, with contributions from many of the leading typographers, designers, and graphic artists. It contained articles on W.A. Dwiggins, Bruce Rogers, Claude Garamond, Eric Gill, Rudolf Koch, Karl Klingspor , 'The Typography of the 'Nineties', ‘On decorative printing in America’ , ‘Mr. C.H. St. John Hornby's Ashendene Press’. etc.